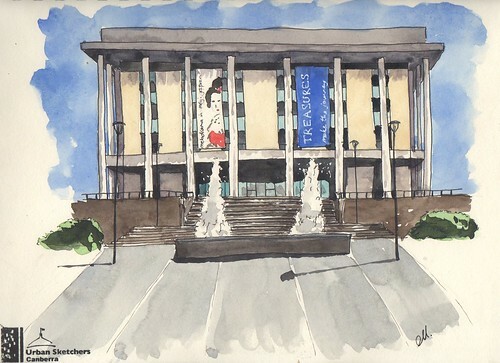 Today’s urban sketcher’s outing was just the antidote to the busy week I’ve had. Sunny, warm-ish in a relative kind of way, and not a breath of wind. What more could i wish for when an opportunity to sketch was in my calendar? 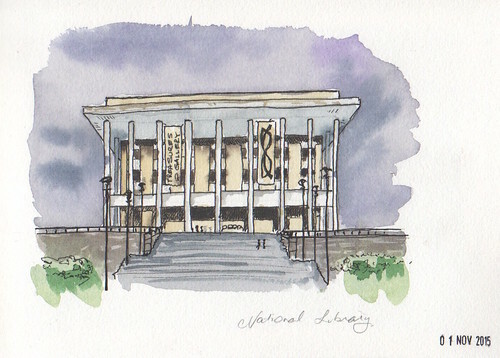 For this month’s outing we revisited the National Library of Australia down on the shores of Lake Burley Griffin. We had been there for a sketching session close to two years ago, and I was excited to be visiting again. A lot of sketches have flowed out of my pen since then, and I decided that I wanted to sit in exactly the same spot and draw exactly the same aspect of the building as I did last time, so that I could see whether or not my drawing/painting skills had improved since then. Before I got there, I was sure I had improved. As I packed up my kit and gathered my brushes and pens, I took a moment to look at the old sketch. I remembered how proud I was of that sketch. I hadn’t been urban sketching long – just a few months – and I was absolutely chuffed that I drew something that actually resembled the edifice. Memories of the day itself flooded back…it was grim and cold and rainy, and I recall retreating to cover halfway through the session to get out of the rain. I managed two pictures that day and had time to spare to chat to my fellow sketchers. But…..by the time I arrived on site this morning, chatted to my fellow sketchers and made my way to my position..I was utterly terrified that what I would produce today would be worse than my original attempt. That I would have learned nothing in the intervening 22 months. ACK!!! The pressure! Stupid brain. I really should have packed my headphones so that I could drown out that nasty little inner critic. Here’s the drawing from November 2015. It was done in a little 8 x 5.5″ Winsor and Newton watercolour sketchbook. Looking at it now I can see that there is one too many columns and inconsistent contrast and shadow. It’s a bit tall and the details have been simplified a lot. Not to mention the wonky upward tilt to the right. I recall using a tiny little brush to try to control the paint – I failed, it bled everywhere. I also remember being utterly terrified, and concentrating hard enough that my tongue was probably poking out between my teeth as I squinted to see the details and try to get it “just right”. But for all that, I was proud of what I had produced. It looked like a building! This is today’s sketch. I worked in a Stillman and Birn Delta Series A4 spiral bound book….so probably about four times the size of the first sketch. I took almost the full two hour session to complete it, and used a big number 12 travel brush, with a terrific point, to paint. My colours are less wishy washy and there is more energy and vibrancy in the sketch. I suspect I used exactly the same pen..my trusty Lamy Safari. Looking at the two sketches side by side, I am pleasantly surprised at the difference. I have improved. I was so much more relaxed today, there was no angst (apart from thinking I’d do worse than last time), and I was methodical and careful about setting up the bones of the sketch before committing to ink and paint. I unconsciously applied the lessons and steps taught by Liz Steel in her Buildings class and various Sketchbook Skool teachers in the classes I’ve taken with them. It felt good. It felt relaxed, and I came away smiling and happy, having spent a morning sitting in the sun chatting to fellow sketchers and strangers passing by, alike. It recharged my batteries after I had well and truly spent them at work last week. Today’s sketch walk was just what I needed. It is so easy to get dispirited with an apparent lack of progress when it comes to sketching, but looking back over old sketchbooks grants a wider perspective, that allows me to take a breath and realise that I really am making some progress. I can see things in today’s sketch that I would change, and that’s part of the process for growing as an artist, but I am pleased with today’s sketch, and perhaps I will revisit in a couple of years and have a fresh set of critiques to apply to my work. Do you take time to look back over old sketchbooks to see how far you’ve come? making ends meet takes energy! I think it would be great if we sat down with our oldest and most recent urban sketches to see how they have changed. I see how all of us have improved when we sit down to sketch.